Husband and wife team Keith and Ellen Smith opened Keith D. Smith Concrete Contractor, Incorporated in May of 1994. With financial help from close friends and all their assets on the line, they started with an old pickup truck, a wheelbarrow, some hand tools, and two employees. Their shop was a shed in their back yard and their office was the kitchen table. Keith managed all field operations, estimating, and project procurement. Meanwhile, Ellen handled all secretarial work and took care of the home and children. The first projects were mainly residential and light commercial work. The days were long and the nights longer, but in just two years, the couple grew their small business to eight employees. In 1996, Keith and Ellen moved their shop from their backyard to a small warehouse in Hanover, Pennsylvania, which had just enough room to house all the material and equipment. Keith always believed in staying up-to-date with the newest concrete technologies, and the same year he brought decorative stamp concrete to the region. Demand for stamp concrete continued to grow, and it remains one of the company’s most successful products. In 1998, the company had grown to 16 employees and it was time for a larger shop location. They settled on a small five-acre farmette in South Hanover—which is where the shop can still be found today. In 2013, Keith D. Smith constructed their current office on the same property, all with our own resources. The new office is currently used for day to day operations, estimating, and management, as well as team trainings and meetings. Between 1996 and 1999, the company began servicing large commercial projects. The company was completing million-square-foot warehouse floors and tilt wall panels on a daily basis. In the early 2000’s the company purchased a dump truck and some excavating equipment to pursue footing packages and gain more market strength. Additionally, in 2002, L&S Formless Curb Company was opened, a division of Keith D. Smith Concrete Contractor, Incorporated. From 2002 to 2007, the company saw continued grow, adding both office and field staff, as well as adding many other services to better serve their clients concrete needs. 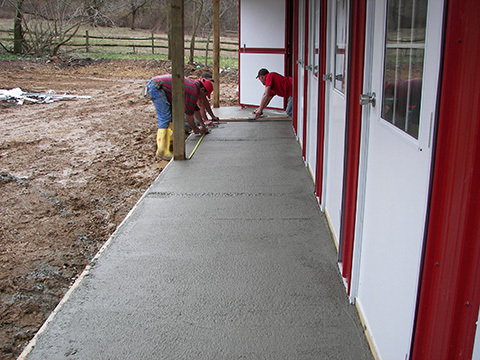 In 2008 the company developed its line of specialty and restoration concrete services. These services include concrete countertops, concrete engraving, concrete staining, and concrete grinding and polishing. Today, the company continues to look forward after celebrating their 20th anniversary in 2014, and having placed and finished millions of square feet of concrete. Keith D. Smith operates with 40 to 50 employees at any one time, and can handle all facets of concrete construction, no matter how large or small, simple or complex. In spring 2014 the company celebrated 20 years in business and set its sights on future growth into the larger commercial market and away from the smaller residential market. It is the company’s intention to continue to service the residential market but on a specific project by project basis. Today the company operates with anywhere between 40 to 50 employees, has obtained the most up to date technology in the industry, and has the ability to handle any project regardless of size or complexity.